As the 400-mile-long wall of storm sawed across the Carolinas toward the Appalachian Mountains, Coast Guard pilots took to the sky to start saving lives from Hurricane Florence. Shortly after 1 p.m. Friday, Coast Guard officials in North Carolina announced that an MH-60 Jayhawk rescue helicopter crew from Air Station Elizabeth City was answering calls for help from local emergency responders fighting life-threatening storm surges, hurricane-force winds and catastrophic flooding. At the same time, Navy leaders in Norfolk said that the amphibious warships Kearsarge and Arlington were tucked behind the slowly dissipating hurricane, waiting for the seas to still so they can sail to the Carolina coasts and start helping, too. Their efforts can’t come too soon. Emergency management agencies in the Carolinas continue to report ripped out trees, pulverized roadways and electrical blackouts that have darkened more than 600,000 homes and businesses. At least three deaths have been blamed by North Carolina officials on the slow-moving storm and they count the number of residents possibly still trapped by rising waters in the hundreds, with many more likely to need rescuing as the trudging hurricane smothers inland counties. During a 10 a.m. Friday briefing, Gov. Roy Cooper called Florence “powerful, slow and relentless" that had morphed into a “violent grind” slowly strangling his state: “It’s an uninvited brute who doesn’t want to leave." To put the ferocity of the devastation in perspective, Cooper said the Tar Heel state has been hit with the highest winds since Hurricane Helene in 1958. And the 9.6 trillion gallons of rainfall deluging North Carolina will mark a once-in-1,000-years disaster. “We’re deeply concerned for farms, for businesses, for schools and even for whole communities which could be wiped away,” Cooper said. Military officials told Navy Times that they’ll rush more rescuers to the region as soon as winds and seas subside, but Mother Nature needs to lend a hand. The National Hurricane Center in Miami reported that while Florence is gradually weakening it continues to reel off strong gusts up to 170 miles inland. 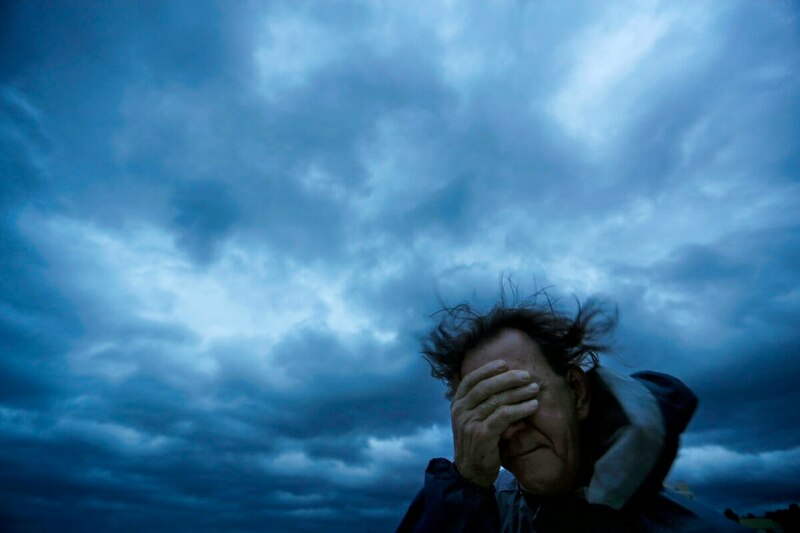 Weather instruments Friday recorded winds gusting at 75 miles per hour at Federal Point, just north of North Carolina’s Cape Fear, and blowing 60 miles per hour at the Fayetteville airport near Fort Bragg, more than 100 miles from the coastline. Storm clouds already have pummeled coastal North and South Carolina with 16 inches of rain — with 40 inches more coming in some areas — unleashing cataclysmic flash flooding and rising rivers, but much of southern Virginia escaped the onslaught. Shortly after 2 p.m. in Norfolk, Rear Adm. Charles Rock, commander of Navy Region Mid-Atlantic, lifted the emergency evacuation order for all active-duty sailors and civilian personnel and their families residing in flood-prone “Zone A” stretches of Virginia. Rock’s decision came several hours after Virginia Gov. Ralph Northam issued a parallel notice removing the mandatory evacuations of his state’s citizens. The Navy order takes effect on Sunday and will allow troops and their families to safely return to southern Virginia. “Our job now is to support the return of the fleet,” said Navy Region Mid-Atlantic spokeswoman Beth Baker. When the fleet gets back, however, remains an open question. U.S. Fleet Forces Commander Adm. Christopher Grady has yet to order the return of nearly 30 vessels that sortied Naval Station Norfolk and Joint Expeditionary Base Little Creek earlier in the week as Florence neared the coast. More than 125 aircraft also exited Norfolk and Naval Air Station Oceana to escape the storm. At Peterson Air Force Base in Colorado, Northern Command officials ticked off the troops and equipment already positioned in coastal areas or on the way. The National Guard has deployed more than 5,000 soldiers and airmen and 10 states are mobilizing more troops to send to the Carolinas. The National Guard, Air Force and Army brought more than 160 helicopters to the storm-ravaged region from as far away as Arizona, plus 240 high-water Army trucks to churn through flooded streets. 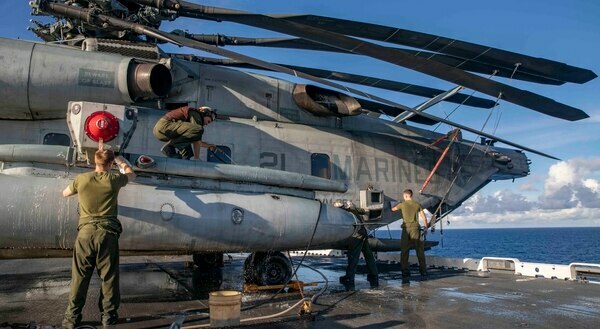 If needed, the Marines and sailors aboard the Kearsarge and Arlington will add a fleet surgical team, 16 helicopters, six MV-22 tiltrotor Ospreys, three ship-to-shore landing craft and dozens of vehicles, generators and other lifesaving equipment to the relief efforts. In towns along a coast stretching from northern Georgia to southern Virginia, 19 Coast Guard shallow-water response boat crews drawn from stations nationwide also were poised to rescue residents trapped by rising waters, too. Deployed from St. Louis to Goldsboro, North Carolina, Lt. j.g. Dana Schmitt urged residents in danger to “seek high ground and call 9-1-1” until his team could save them. Maj. Gen. Gregory A. Lusk, the adjutant general of the North Carolina Army and Air National Guard, said that more than 500 citizen soldiers from outside the Tar Heel state already were helping his 11,500 soldiers and sailors on rescue and recovery missions.